A brand new iPod touch shows the language screen. An iPod touch that has been set up before shows the Wi-Fi Networks screen, and you can jump to Step 4. Tap your language choice, and then tap the right-arrow icon in the top-right corner of the language screen. Tap your country or region, and then tap Next. After tapping Next, the Wi-Fi Networks screen appears. 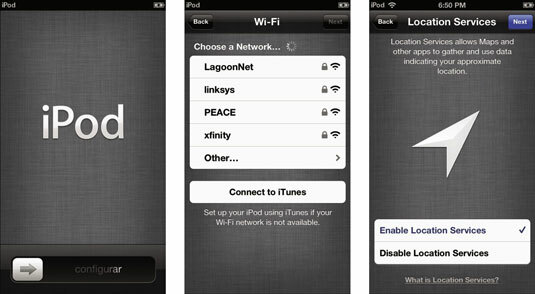 If you don’t have a Wi-Fi network at your location, and no networks are within range, you need to connect your iPod touch to your computer and use iTunes to continue with setup and syncing. Tap the network name if it is not already selected, and then tap Next in the upper-right corner of the screen. The closest network with the strongest signal should already be selected (with a check mark next to it); if not, tap the network name. Type a password for the Wi-Fi network if needed, and then tap Next in the upper-right corner of the screen. Tap Enable Location Services, and then tap Next in the upper-right corner. By choosing to enable Location Services, you are giving your iPod touch the chance to figure out the appropriate language and country for using your iPod touch. If you don’t enable Location Services, you see screens that let you choose your language and your country. Set Up as New iPod touch: Select this option if you want to set up the iPod touch as new, and then tap Next. Restore from iCloud Backup: Select this option if you previously backed up your settings for an iPod touch, iPad, or iPhone to iCloud. You can then pick an iPod touch, iPad, or iPhone name from the pop-up menu to restore the previous device’s name and settings. Restore from iTunes Backup: Select this option to restore a previous device’s name and settings from an iTunes backup. 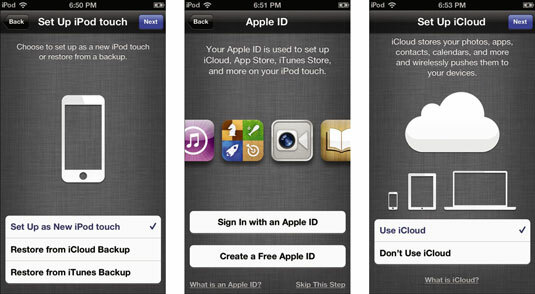 When the Apple ID screen appears, sign in with your Apple ID or create a free Apple ID. If you have an iTunes Store, Apple Store, iCloud, or Apple developer ID, tap the Sign In with an Apple ID option and enter the ID and password. You then see a Terms and Conditions screen, and you have to tap Agree to continue. If you don’t have an Apple ID of any kind, tap the Create a Free Apple ID option. You see a screen for entering your birthday and then a screen for entering an Apple ID and password combination. You then see a Terms and Conditions screen, and you have to tap Agree to continue. When the Set Up iCloud screen appears, tap Use iCloud and tap Next in the upper-right corner. Tap Use iCloud to set up the free portion of your iCloud service, which you can use to sync your iPod touch with content and personal settings. If you did not use iCloud in this step, you’re finished — and you need to continue setting up your iPod touch with iTunes on your computer. When the iCloud Backup screen appears, choose iCloud or your computer for backup, and then tap Next. Both iTunes on your computer and the iCloud service can back up your iPod touch settings when you sync the device. You can apply the settings to a new iPod touch or to one that you had to restore to its factory condition. If you generally sync your iPod touch with your computer using iTunes, tap the Back Up to My Computer option. If you sync your iPod touch from iCloud, you can tap Back Up to iCloud. Then tap Next to finish setting up your iPod touch. Turn on Find My iPod touch, and then tap Next. When the Messaging screen appears, deselect e-mail addresses that other people should not use to reach you with Messages or FaceTime, and then tap Next. Other people that use Messages or FaceTime on their iPhones, iPads, iPod touches, or Macs running Mountain Lion, can contact you at the e-mail addresses listed on the Messaging screen. By default, the e-mail address you use with your iTunes Store account is listed and active, along with any other e-mail accounts that were synced with this device previously. Tap any e-mail address to deselect it so that other people can’t use it to communicate to your iPod touch. When the Siri screen appears, tap Use Siri, or Don’t Use Siri. Siri is Apple’s voice-based personal assistant, which you can use to ask for directions, look up contacts, search the Internet, and schedule appointments. You can even use Siri to take dictation. When the Diagnostics screen appears, automatically send (or don’t send) diagnostics and usage information. Tap Automatically Send to send the information, or tap Don’t Send to not send it. This is your chance to help Apple improve the product — by automatically sending this info to keep Apple on its toes. Remember, however, that your location may also be sent with diagnostic information, depending on whether an app was using your location. Start using your iPod touch. Your iPod touch is ready to sync with iCloud if you chose to use iCloud, and ready to back up its settings to iCloud if you chose that option. This all happens wirelessly over the Internet. If you don’t use iCloud, you can sync your iPod by connecting to iTunes.